Being planned - Check back later. Install these choose-your-own-adventure style lessons and learn how to use node.js, npm, mongodb and other related tools by writing code to solve realistic problems. The lessons run in your terminal and work on Windows, Mac and Linux. Select a lesson below to get started! 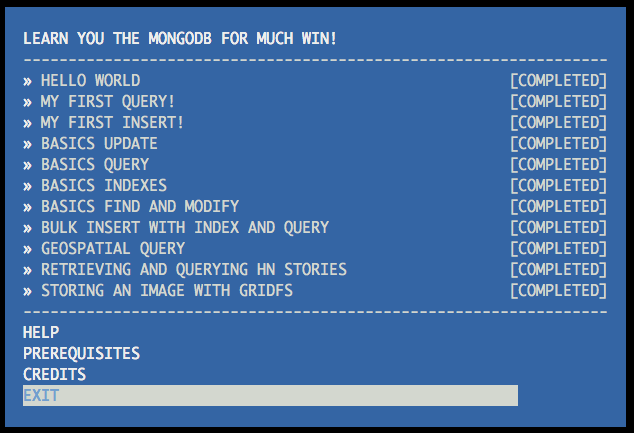 Learn You The MongoDB For Much Win! There are a number of electives in development, however feel free to create your own material and either fork this project or make a pull request back to have it added to this website. Please refer to the learnyoumongodb code of conduct for further guidance on this process. is licensed under a Creative Commons Attribution-ShareAlike 2.0 Generic License.